Dangers of Asbestos: Protecting Your Family | Inspect A Home, Ltd.
Asbestos can be found in paint, ceiling and floor tiles, sprayed-on insulation, and more places in your home. The dangers of asbestos led the U.S. Consumer Product Safety Commission to put a ban on its use in gas fireplaces and wallboard patching compounds in the late 1970s since cancer-causing asbestos fibers could be released when these were used. Asbestos can also be found in vermiculite, which has been used in crayons and in gardening materials. What Are Some Of The Dangers of Asbestos? If asbestos fibers are released into the air, they can accumulate in your lungs, stomach, larynx, ovaries, and colorectum, which can cause inflammation, scar formation, and more serious diseases. Asbestos is considered a carcinogen, which means that it is a substance that is known to cause cancer. Asbestosis is a disease that can cause shortness of breath and even permanent lung damage. Pleural plaques and other health-related issues can also be caused by exposure to asbestos. If you breathe in dust containing asbestos fibers, you’re at risk of asbestosis, lung cancer, and mesothelioma. Symptoms often take many years to appear, so it’s best to have a professional company test your home for asbestos to protect you and your family. When Do You Need To Have Your Home Inspected For Asbestos? If you plan to remodel your home, asbestos can be released into the air during the process. If you find building materials in your home that are falling apart, such as damaged drywall and insulation, asbestos may also be present in your environment. If either of the above conditions applies to your home, you should hire a trained inspector to check for asbestos. A professional knows exactly what to look for and will take samples of suspect materials for proper analysis. Doing this on your own is highly discouraged since improper sampling can be even more dangerous than leaving the materials intact. If asbestos-containing materials are undamaged, keep in mind that they are unlikely to cause you and your family harm. It is best to leave these materials untouched if they are intact. 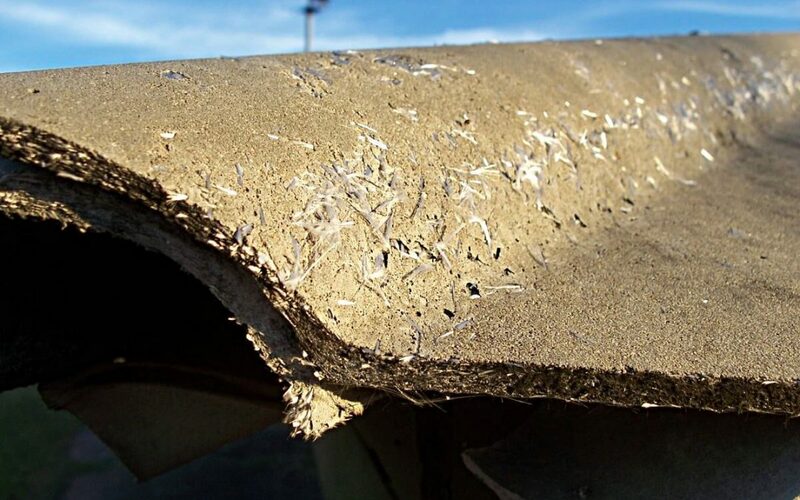 Inspect the materials for signs of extreme damage, moisture, and even wear-and-tear. If you suspect that an asbestos-containing material is releasing fibers into the air or if you have decided to remodel the area, leave everything in place and arrange for a professional inspection immediately. Sealing, covering, or removal may be called for. Be sure to hire a home inspector who specializes in asbestos testing. If you’re in New York, NY or Greenwich, Connecticut, and surrounding areas contact Inspect A Home today! In addition to testing for asbestos, we offer many specialty services including Thermal Imaging, Radon Testing, Mold Testing, and Water Testing so you can be sure your home is environmentally safe for your family. More information about the dangers of asbestos can be found on the EPA’s website.